State Comptroller Kevin P. Lembo confirmed Monday that a recent surge in projected income tax receipts has left the current budget on pace for closing with roughly a $250 million surplus. In his monthly forecast, the comptroller projected the $19 billion General Fund will close June 30 $245.7 million in the black, a surplus of about 1.3 percent. This effectively matches the $254.9 million surplus forecast issued by Gov. Dannel P. Malloy’s budget staff on Nov. 15. “The withholding portion of the income tax continues to perform well year-to-date, in line with job gains in recent months,” Lembo said. Paycheck withholding comprises roughly two-thirds of the $9.6 billion the income tax is expected to raise this fiscal year. The remainder comes from quarterly payments, which largely reflect capital gains, dividends and other investment earnings. This segment of the income tax has been subjected since last November to a new “volatility cap” that forces Connecticut to save all funds received above an inflation-adjusted-threshold that this fiscal year stands at $3.2 billion. Over the last 21 months, income tax receipts from investment earnings have been at their most robust since before the last recession. Both the comptroller and the governor estimate the state could clear that threshold by as much as $648 million and deposit that money in its reserves. If both the $250 million General Fund surplus and the $648 million in volatility cap funds are added to the Rainy Day Fund, which already holds $1.2 billion, Connecticut’s reserves would top $2 billion. 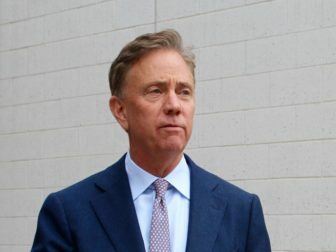 Gov.-elect Ned Lamont already has said he doesn’t want to tap these funds, arguing Connecticut needs to retain its reserves as a safeguard against the next recession. Lamont’s fellow Democrats in legislative leadership, though, have said lawmakers will want at least to discuss possibly spending some of those reserves. That’s because nonpartisan analysts project major deficits for the upcoming two-year state budget — even considering the surging tax receipts. Lamont must submit a plan to the legislature in mid-February to balance both fiscal years.